Janelle Monáe | The Electric Lady - TheUrbanMusicScene.com | Music Reviews! It could be argued that popular music, particularly R&B is in an age that relies too heavily on conformity. Trendiness often has commercial aspirations in mind (aka money), but sometimes joining the bandwagon hurts creativity and originality in music. Janelle Monáe eschews being like everybody else – she doesn’t buy into conformity in the least. She’s classified as an R&B artist rightfully, but truthfully, Monáe dabbles in a little bit of everything within her music. Eclectic and extremely creative artistically, Monáe’s sophomore album, The Electric Lady, takes on those virtuous musical qualities. Perfection is difficult to achieve, but The Electric Lady makes a sound argument throughout its course. 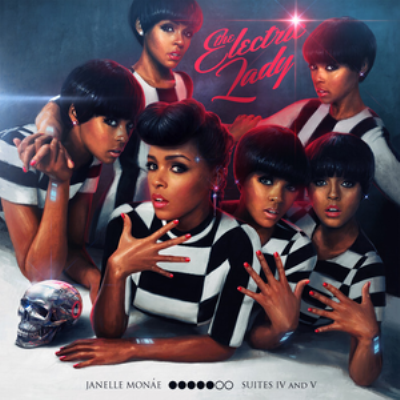 Monáe co-writes the majority of The Electric Lady, in addition to serving on a production team including Nate Wonder, Chuck Lightning, and Roman GianArthur. Monáe, Wonder, and Lightning join Sean “Diddy” Combs as executive producers of the set. The Electric Lady doesn’t end with just four standouts – there’s more goodness to be indulged upon. “We Were Rock and Roll” can be likened to a quicker continuation on “Primetime”, at least in regards to the central theme of the power of love. “Ghetto Woman” has ‘throwback’ written all over it, but without suffering from an anachronistic fate. With an element of empowerment about it, “Ghetto Woman” parallels earlier gem, “Q.U.E.E.N.” in many regards. “Sally Ride” is clever, expressing numerous messages, including several allusions to the late Sally Ride. Among those messages, it wouldn’t be far-fetched to read into references of women’s empowerment, freedom of choice in social regards, or the Monáe’s ubiquitous references to individualism and nonconformity. Esperanza Spalding joins Monáe on penultimate cut “Dorothy Dandridge Eyes”, yet another romantic-oriented cut that drops a not-so-subtle reference to actress Dorothy Dandridge – imagine that! Throughout its course, The Electric Lady is nothing short of an exceptionally conceived album. Consistent from start to finish, there are few flaws of note – nitpicking is incredibly difficult with an album of this high caliber. Vocally, Monáe is among today’s elite in the soul realm, delivering compelling, complete, and nuanced vocal performances. Even the rapping isn’t too shabby; she may not be the next Missy Elliott, but Monáe can certainly “bust a rhyme”. Ultimately, the ultra eclectic artist’s sophomore LP is a champion. Enthusiastically recommended – one of the top five best albums of 2013.